If you are looking for the ideal getaway where you can just put the rest of the world aside, and leave it there for a while, you will find it at the Koh Samui villas. 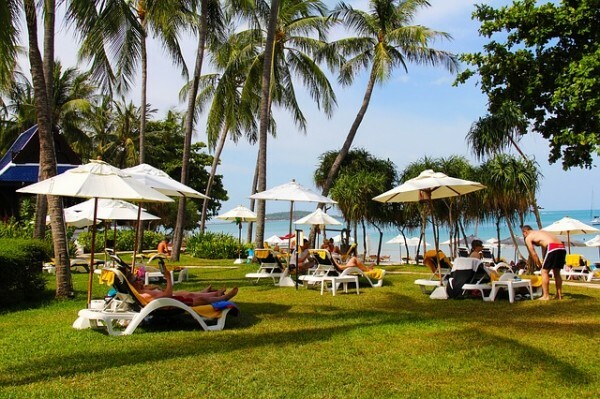 Koh Samui is the third largest island in Thailand, and since Thailand is noted the world over as one of the best vacation spots globally, Koh Samui must be one notch or two above that ranking. As a matter of fact the notches could be elevated a bit higher because you will not believe what a paradise it is until you experience it. But you probably would not be impressed by miles of pristine white beaches, with elegant villas edging up just yards from the shoreline, with all of the accommodations that you have ever dreamed about and then some. And you no doubt would not be interested in the fact that you are only a 10 to 15 minute ride away from some of the finest restaurants, bars, entertainment and shopping in the entire Southeastern Asia region. No I’m not sure that you would be too impressed by all of that, but if you are you have hit the jackpot with the villas at Koh Samui. Take the 2 bedroom garden villa with a pool at Choeng Mon Samui. You will simply love this Balinese style villa located on a hillside close to the beach. Here you get to experience the feel of staying back in the palm trees with the cooling shade, while still being within walking distance from the beach. Your accommodations are set in a large garden that is walled, with beautiful shrubs and mature coconut palm trees. Your living pavilion, one of three pavilions has a lounge area furnished with comfortable sofas and furniture. You will enjoy your satellite TV along with your well equipped kitchen that is fully stocked with food. You have a breakfast bar and a large dining area able to accommodate six guests in addition to you and your partner. Your kitchen has all modern appliances, and if you wish, you can summon the chef service at anytime to prepare gourmet meals at your desire. A series of steps takes you down to your sparkling pool area, and the master bedroom pavilion epitomizes luxury at its utmost with the Balinese style king sized bed. All the sliding doors and windows have mosquito screens, and all of the bedrooms have air conditioning. If you need a massage, simply call the front desk and you may have an in villa massage. You receive a daily continental breakfast along with maid service on a daily basis as well. Your time is your own and if you want to go shopping, have lunch at a cafe, or spend the day on the beach or at your pool, it is up to you. Get up in the morning when you feel like it, and then decide what you wish to do. One thing for sure will happen and that is that you will not get everything done on your first trip, so it will be imperative that you return for another trip to finish up.